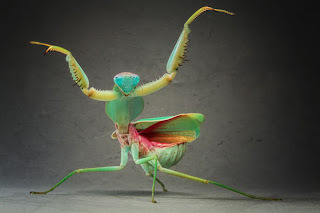 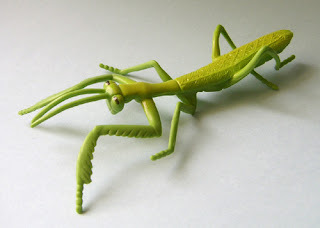 Mantodea (or mantises, mantes) is an order of insects that contains over 2,400 valid species and about 430 genera in 15 families worldwide in temperate and tropical habitats. 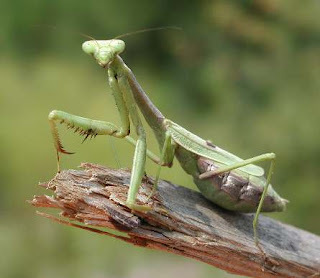 Most of the species are in the family Mantidae. 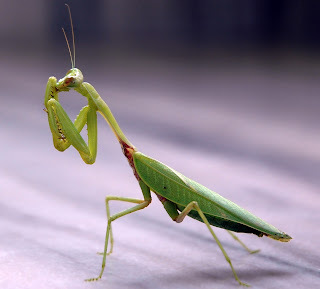 The English common name for any species in the order is "praying mantis", because of the typical "prayer-like" attitude with folded fore-limbs, although the eggcorn "preying mantis" is sometimes used in reference to their predatory habits. In Europe and other regions, however, the name "praying mantis" refers to only a single species, Mantis religiosa.